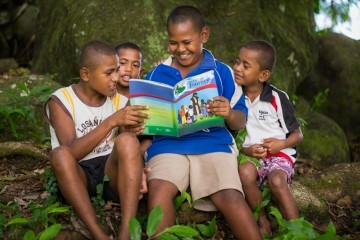 Across the Pacific island nation of Fiji, the mango tree—a sacred object in Hinduism—is being used as a classroom for boys and girls of diverse religious backgrounds to learn about Jesus through The Greatest Journey, the discipleship course Samaritan’s Purse developed for children who receive Operation Christmas Child shoebox gifts. 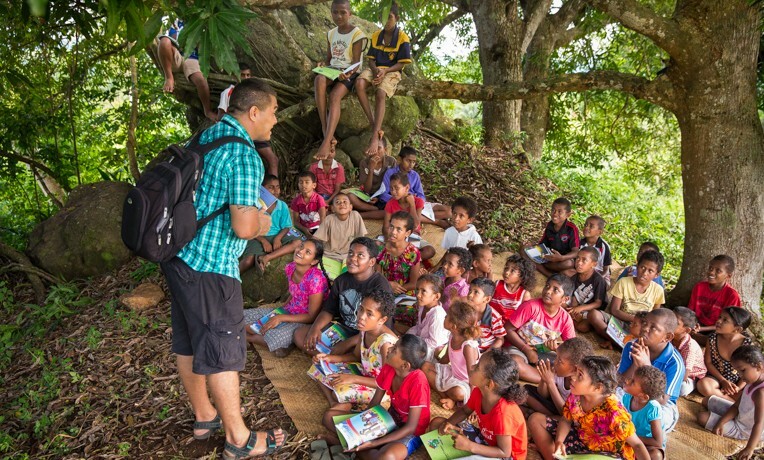 Getting to one of these open-air classrooms on Viti Levu, Fiji’s largest island, means traveling a long, gravel road lined with 10-foot high sugar cane. Nestled in these fields outside the gold-mining town of Tavua is a Hindu farming village. After receiving a shoebox gift, many children enroll in The Greatest Journey. A month later, the pastor started the first of the 12-lesson course. He anticipated 25 children might attend the initial class, but on that Sunday afternoon boys and girls kept coming until there were nearly 50 present. As the younger children gathered in a Hindu family’s home, the older ones huddled outside under a mango tree to listen to Pastor Anand Singh, a former Hindu, teach in Hindi and English. Pastor Rohit looked on, pleased that a new generation was learning about Jesus. Pastor Anand was also excited to see all the boys and girls. “Its hard for Hindus to come out of their homes for church programs,” he said. As he taught the first lesson about God as Creator, Anand had some of the children stand up and hold signs of each word in Genesis 1:27: “So God created man in His own likeness.” The class read it in unison again and again to help them memorize it. It started lightly raining, but the class continued until it began to pour. 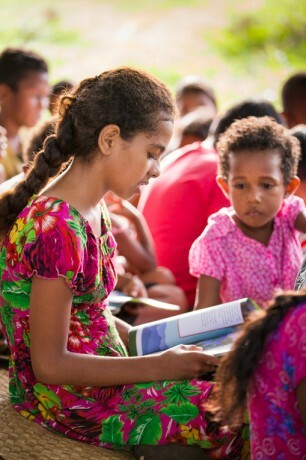 Children in Fiji are praying to receive Christ as savior after learning about him through The Greatest Journey. A month ago, the children had the opportunity to hear about Jesus and experience His joy when they received a shoebox gift. Now, they had taken the first step on a lifetime journey of following Christ and telling others about Him. Anand is the coordinator for The Greatest Journey in northwest Fiji, serving 300 churches. He introduces the program and trains the local teachers how to conduct the classes. The 12-lesson course is broken into three segments. The first four lessons talk about who God is. The next four describe how to walk with Jesus, while the last four teach children how to share their faith with others. 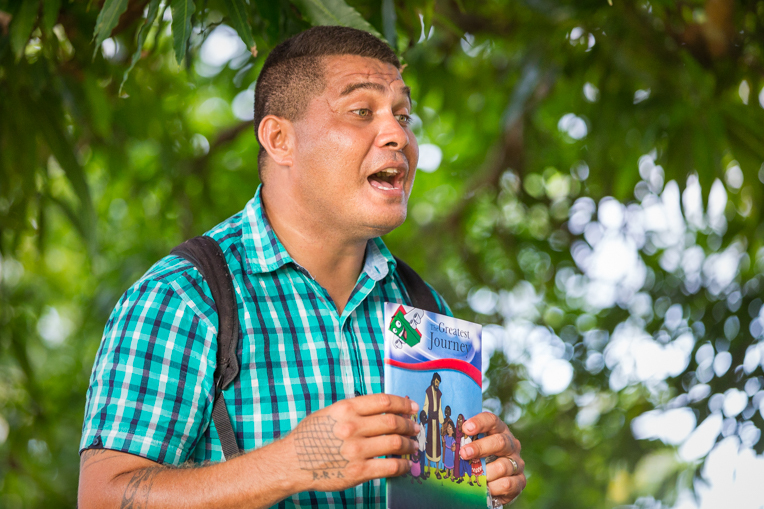 The lessons give church leaders like Pastor “Waisea“ Liwaiano an opportunity to take the Gospel into villages—and under mango trees—across the island nation. “Do you want to learn about Jesus?” Waisea asked again. “YES!” They cheered even louder. If there is no room under the mango tree, some children use a branch. This is not the first class to meet here. Earlier, a class of 15 started the course under a smaller tree across the road. By the third lesson they had grow to 80 participants (including parents) so for the fourth lesson they moved to this bigger mango tree on the hill. Seeing the need for even more room, the man who owned the land offered a piece of his property to the participants so they could build a shelter. Before the fifth class, they built a 12-foot high open-air shelter with a tin roof. The children continued to meet under the mango tree, while under the shelter Waisea taught the parents the same content geared for adults. Twelve-year-old Ilisabeth was part of the classes. She still has her favorite item from her shoebox gift—a doll named Teddy. But more than that, she enjoys learning how Jesus Christ died for her sins, and talking about this with her brothers at home. Her favorite verse is “I can do everything by the power of Christ who gives me strength” (Philippians 4:13). Sakiusa and his friends enjoy learning about Jesus. For 10-year-old Sakiusa, his most prized gift in his shoebox among the book, ball, soap, and pencil case he received was a toy car. He, too, likes to learn about Jesus and his favorite part of The Greatest Journey is lesson four about Jesus being his best friend. He made the decision to accept Christ during that class. Sakiusa travels four hours to Laduna with his mother each week for school. They only return home to his father on Fridays and Saturdays. His friendship with Jesus gives him greater help and companionship for his constant journeys. Regardless of the island, children in Fiji are accepting Christ as their Savior and sharing Him with their friends and family through The Greatest Journey discipleship classes. Mango trees are fostering growth in Christ rather than being used in worship to other gods. Pastor Waisea, the national coordinator for The Greatest Journey in Fiji, is excited to see how God will use the program to impact his nation for future generations. “Pray for every little child who has gone through The Greatest Journey so that what has been planted in them will grow, causing them to become missionaries, pastors, and mentors,” he said.